Or, at least, it would have been had we bought a better example of the main ingredient. After several pleasant, sunny days, this morning dawned dull and overcast. A few spits of rain fell. As a diversion, Francine decided to go and try to find a particular vantage point used by the excellent landscape photographer, David Noton, for one of his Carcassonne shots. There is a great view of Carcassonne from the autoroute running south of it, looking north towards Les Montagnes Noires [the Black Mountains]. However, Mr. Noton’s shot appears to be taken from the north looking south towards the Pyrenees. Off we set in search of his higher ground. To cut a long story short, we never found it; the eminent Mr. Noton’s secret remains safe. Personally, I prefer the tourist view looking north, anyway, not that that’s particularly significant. Regardless, today was definitely not the day for taking photos of one of France’s most impressive sights. On our way back to Guillaume, we called into a Intermarché to see what lunch we could find. Having recently sated my craving for andouillette, I now felt a hankering for one of France’s classic warm salads (? ), a salade tiède de gésiers. Gesiers are gizzards, usually either chicken or duck. Here is another delicious ingredient that we usually either throw away or, at best, use in the making of stock. Mea culpa. When we are lucky enough to buy a bird complete with a set of giblets, the gizzard is included. It’s the bird’s crop which, in life, is filled with grit and used for grinding down vegetable matter that it’s eaten. The gizzard is a very strong muscle. We eat hearts, which are just strong muscles, so let’s give gizzards a try. Why not? If you’ve ever actually tried frying and eating a gizzard, you will know just how exceptionally coarse and tough they are if treated without respect. Crunch – your teeth can barely penetrate it! 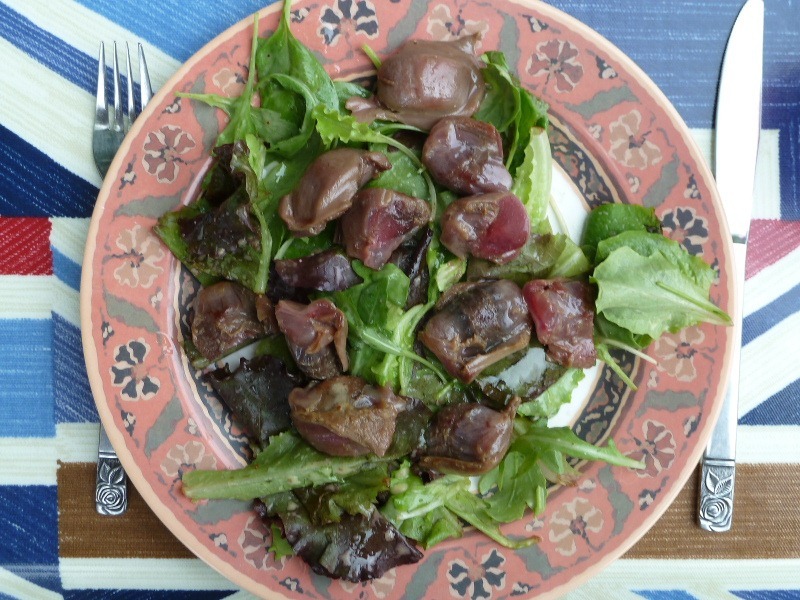 The gastronomically wise French make a confit out of gizzards by simmering them long and slow at low heat in fat. This transforms the otherwise inedible bullets into something meltingly tender and delicious. At least, they are delicious when done well. Even Francine likes them. Regrettably, the examples we bought at our Intermarché, though tender enough, lacked a little je ne sais quoi in the seasoning/flavour department. We’ve had much better. Don’t get me wrong, these weren’t bad, just not as good as they should have been. Shortly after sitting down to our lunch, the rain began and we were forced to retreat under Guillaume’s awning. Postscript: peels of thunder can now be heard. Hot and sunny in VA. Hot and sunny here now, too. who knows for how long, though?